Republican Presidential candidate Donald Trump still holds a solid lead in New Hampshire, according to the latest CNN poll released Wednesday. Texas Senator Ted Cruz is gaining ground during his "Cruzin' to Victory" bus tour in New Hampshire. At one of his last stops in the Granite State Thursday, Cruz sat down with families inside the St. Anselm College Institute of Politics and talked everything from music, to games, and his kids. At one point, Cruz was interrupted by a die-hard Star Wars fan, given a light saber, and asked to sign a "Jedi Pact." "Thank you and may the force be with you," the local resident said to Senator Cruz. It was a certain break from the typical campaign stop for Ted Cruz. "Ya'll treat politics like we treat football in Texas," he said to the crowd. Cruz talked health care, social security, and national security, but also talked a bit more than usual about his personal life. "Our girls are seven and five and we will sit there and play Plants versus Zombies or Candy Crush," he said. Cruz also recalled his college years. "I've played more than a game or two of beer pong, I will confess to that," he said laughing. Reporters, however more interested in Cruz's response to former Republican presidential nominee Bob Dole who said this week a Cruz nomination would be "cataclysmic" for the GOP. "What Bob Dole is effectively saying and what the establishment is saying is, 'the one guy that scares the heck out of us is Cruz because Cruz will stand with the American people and against the career politicians in both parties,'" Cruz said. While Donald Trump still holds a 20 point lead among Republican voters in New Hampshire, Cruz has climbed into second place with 14 points according to the latest CNN poll released Wednesday. Establishment candidate Marco Rubio losing ground, now tying Jeb Bush with 10 points in third place. When NECN asked Rubio what the shift meant for him, he replied, "Nothing, it's one poll, these polls are all over the place, wherever we go in New Hampshire we have great support." The Republican front runners can't agree on much of anything, except what they consider a dire need to beat the Democratic nominee. "We are likely to be facing Hillary Clinton who really embodies the bipartisan corruption of Washington," Cruz said. "If I am the nominee, we will beat Hillary Clinton or Bernie Sanders for that matter, we cannot lose this election," Rubio said. That same CNN poll shows that only 31 percent of Republicans polled have actually made up their minds about who they will support. 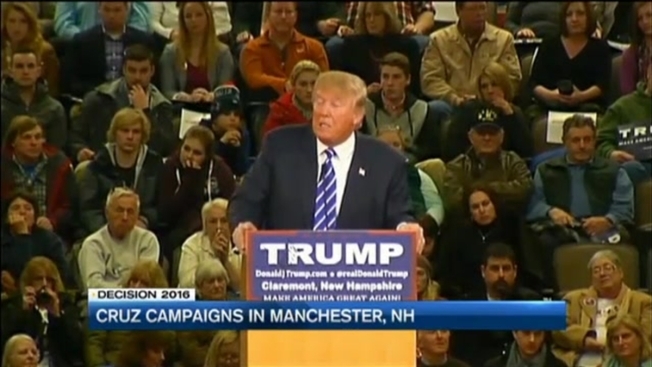 The only New Hampshire poll that will be truly accurate is the one taken on February ninth.